Andrew's music is featured on the soundtrack for award-winning HBO documentary It Will Be Chaos (directed by Lorena Luciano & Filippo Piscopo). includes two of Byrne's recent works. 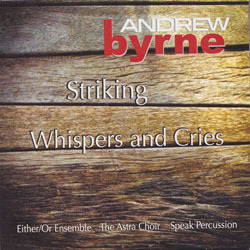 Striking, for amplified string quartet and chopsticks, is entirely built from extended string techniques and is the latest example of Byrne’s interest in creating evocative soundscapes using unconventional techniques. Whispers and Cries is scored for choir and a menagerie of percussion and keyboard instruments including Chinese opera gongs, toy instruments, bells, a celeste, a harmonium, and a regal. features Byrne's music for piano and metal percussion. The central work Tracks presents the solo piano in its most 'normal' sound while the opening piece White Bone Country towards reduced sound-reveries in processed piano and small metal percussion, and Mirages into pure sonic fantasies made from sampled sounds of prepared piano. is a collection of new music for piano featuring Byrne's Six Dances for solo piano as well as works by John McCaughey, Nigel Westlake, Andrew Ford, Andrew Byrne, Mark Pollard, and Michael Kieran Harvey. It won the best classical CD of 2008 in Melbourne's Herald-Sun. combines hard-edged post minimal instrumental pieces with vocal tracks suggesting warped German cabaret songs. Added to the mix are electronic soundscapes, by sound designer Steve Stelios Adam. Together they form a CD that blurs the boundaries between experimental new music, world music and rock'n'roll.